The worldwide prevalence of obesity nearly doubled between 1980 and 2008. According to country estimates for 2008, over 50% of both men and women in the WHO European Region were overweight, and roughly 23% of women and 20% of men were obese. 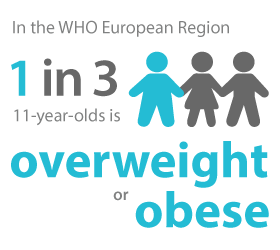 Estimates of the number of overweight infants and children in the WHO European Region rose steadily from 1990 to 2008. Over 60% of children who are overweight before puberty will be overweight in early adulthood. Childhood obesity is strongly associated with risk factors for cardiovascular disease, type 2 diabetes, orthopaedic problems, mental disorders, underachievement in school and lower self-esteem. Participation in 150 minutes of moderate-intensive aerobic physical activity each week (or equivalent) is estimated to reduce the risk of ischaemic heart disease by approximately 30%, the risk of diabetes by 27%, and the risk of breast and colon cancer by 21–25%. In addition, it has positive effects on mental health by reducing stress reactions, anxiety and depression and by possibly delaying the effects of Alzheimer's disease and other forms of dementia. In Europe, estimates indicate that over one third of adults are insufficiently active. Men were more active than women, particularly in high-income countries, where nearly every second woman was insufficiently physically active. Through decisions impacting urban design, land use and transport, societies have become increasingly car-friendly over time, and there is a growing geographical separation of living, working, shopping and leisure activities. As a consequence, the role of active modes of transport, such as cycling and walking, has decreased dramatically in some countries, as have opportunities for active recreation. Recent research has also suggested that people should reduce extended periods of sedentary behaviour, such as sitting at work or watching television, since these may constitute an independent risk factor for ill health regardless of other activity levels. The HBSC 2009/2010 survey of countries in the WHO European Region and North America found that girls across all countries and age groups report being less active than boys, with the gender gap increasing with age. The survey found that in general 15-year-olds (average 15%) were less likely to report meeting the physical activity guidelines than 11-year-olds (average 23%) in the majority of countries. Only 19% of 11-year-old girls report engaging in moderate-to-vigorous physical activity for at least 60 minutes per day. For boys, the figure is 28%. A daily breakfast and at least daily fruit consumption are seen as two of the most important healthy eating habits. In the HBSC study, eating breakfast daily was signiﬁcantly associated with higher family afﬂuence in the majority of countries for boys and over half for girls. Similarly, low family affluence was signiﬁcantly associated with lower levels of fruit consumption among boys and girls in the majority of countries surveyed. Health in later life is influenced by an accumulation of experience across the life-course. A life-course approach is therefore needed to effectively promote physical activity and to reduce the burden of noncommunicable diseases in Europe. It starts by ensuring physical activity before and during pregnancy and continues with appropriate levels of physical activity for infants and their parents. Action to encourage physical activity for children and adolescents in day-care centres, kindergartens, schools and the community is reinforced and sustained by the promotion of physical activity as a part of daily life for adults and for older people, at home, in the community and at the workplace. It also includes the promotion of sufficient levels of physical activity in health-care settings, such as primary health-care centres, hospitals and residential homes. WHO's recommendations for preventing and managing obesity emphasize the need for coordinated partnerships involving different government sectors, communities, the mass media and the private sector to ensure that diet and everyday levels of physical activity can be changed effectively and sustainably. Data warehouse that collects, stores and displays information on chronic diseases and their risk factors for all WHO member states.